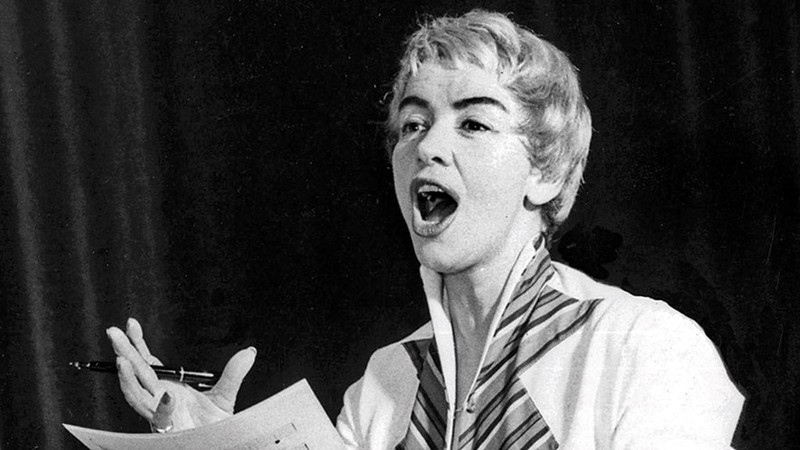 Dorothy Squires was once Britain’s highest paid female singer, yet her name has slipped through the cracks of time. Emerging during the 1940s, she went on to achieve glittering success, firmly establishing herself as Britain’s first diva. Elvis was a fan, she nearly replaced one of the Andrews sisters, and she lived a glamorous lifestyle in Hollywood with her husband Roger Moore. Despite reaching the pinnacle of her profession, she was beset by fire, flood, heartache and libel. Dorothy’s dramatic life story ended back in Wales, where she lived as a recluse for the last years of her life. Despite her humble beginnings as Edna May Squires, born in a traveller’s caravan in 1915 near Llanelli, South Wales, ambition and determination drove her to leave Wales for London on an express train when she was 18 years old. There she met musician Billy Reid. As lead vocalist for his Accordion Band, Dorothy made her first record, ‘When The Poppies Bloom Again’ in 1936. More recordings followed in the late 1930s, as well as appearances at the Saturday Night Revue, until the arrival of World War Two halted the production of any more records. The end of the war in 1945 made it possible to begin recording music again, and blonde, petite Dorothy brought glamour to post-war Britain. Along with her incredible vocals and Billy’s musical talent, the duo enjoyed unprecedented success. As the 1940s came to an end, Dorothy and Billy had released a succession of hit singles, had regularly headed the bill at variety shows and were in regular broadcasts on the radio. Despite the success of their professional partnership, their personal relationship broke down, and a new chapter of Dorothy’s life began. Hosting a party at her house in Bexley in the early 1950s, Dorothy was introduced to a young Roger Moore, who was an aspiring actor making ends meet by modelling knitwear. Despite Roger being 12 years younger and married to someone else, a passionate relationship began and they were married in 1953. 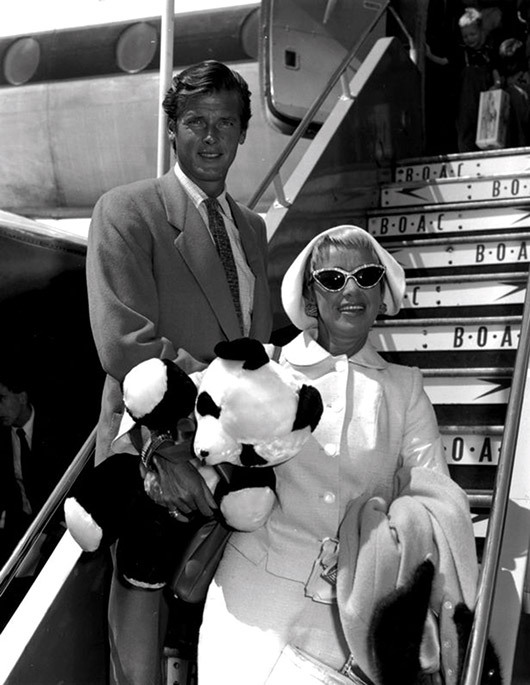 The couple lived in the United States for most of the 50s, with Dorothy using her contacts and bank balance to help her husband with his fledgling acting career. It was a glamorous lifestyle, living in New York and Hollywood, with trips to Las Vegas to gamble and socialise with fellow musicians and actors. Roger’s career had taken off thanks to Dorothy negotiating his first American film contract, and his small role in ‘The Last Time I Saw Paris’ with Elizabeth Taylor set him firmly on the path to stardom. Dorothy turned her attentions back to her own career in the mid 50s when she launched a series of singles and began a cabaret act at Hollywood’s Moulin Rouge, where Elvis reportedly attended several of her performances. Dorothy was even invited to replace one of the Andrews Sisters, but never one to share the limelight, she turned it down. As the 1960s began, Dorothy released a song of her own, ‘Say It With Flowers’, with the pianist Russ Conway, hosting a magnificent launch party at her British house. The 1961 single stayed in the charts for 10 weeks, and Dorothy received the rare honour of playing the Talk Of The Town nightclub in London. At the height of this success however, tensions started to surface in Dorothy and Roger’s dazzling life, and it seemed that their accomplishments had come at the cost of their marriage. Roger left Dorothy for another woman that year. Alone and heartbroken, Dorothy turned to writing her own songs, sporadically releasing them as singles. Never one to lick her wounds, this quieter period in her singing career was short-lived, and in the late 60s Dorothy released a succession of new albums, with the single ‘For Once In My Life’ giving her another long chart success. This was exceeded with a 23 week run of her version of ‘My Way’, beating Sinatra’s and Bassey’s previous versions in chart position. Dorothy seemed unstoppable, but the most challenging and dramatic period of her life was about to begin. Dorothy felt that she was not being given the attention she deserved from the media, and in a bold move announced that she would be putting on a concert at the London Palladium using £5,000 of her own money. It was a risky strategy much mocked by her critics, but Dorothy’s optimism paid off and on 6th December 1970 she walked on stage to a full house and a standing ovation. Riding another wave of incredible popularity, Dorothy put on more Palladium shows, as well as shows in New York and Los Angeles. 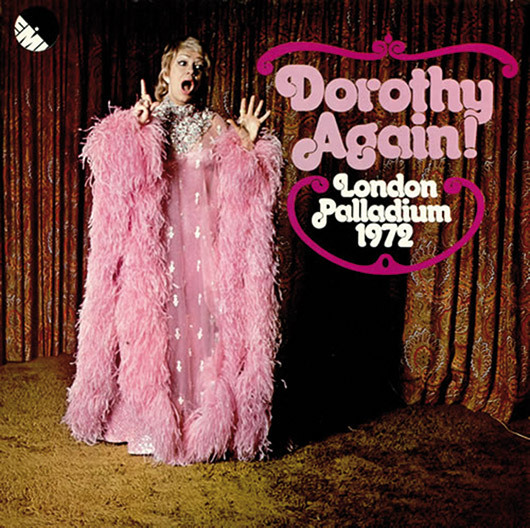 Wearing flamboyant stage costumes of sheer kaftan trimmed with feathers or with rhinestone collars and matching skull-caps, Dorothy’s intense stage presence made her performances electrifying. She sang like her life depended on it. The start of a downward spiral from the dizzying heights Dorothy had reached began with a series of court cases, the most notable being allegations by the News of the World newspaper that Dorothy had bribed radio stations to play her records. Dorothy emerged with £30,000 in damages, but it was the only case she would win. A series of tragic events soon followed, beginning with her Bexley home burning to the ground in a fire. While Dorothy was lucky to escape with her life and her treasured love letters from Roger, she lost her beloved dog and took a big financial hit due to being under-insured. Her next home, a riverside mansion in Bray, was flooded within weeks of her moving in. Dorothy remained resilient, quipping “I don’t think anything else could happen to me”. For the rest of the 1970s Dorothy continued performing, and even enjoyed success as a racehorse owner. Little did she know that this would end abruptly, when her relentless pursuit of further court cases – all unsuccessful – would result in her being declared ‘a vexatious litigant’. Along with rumours of how volatile she was to work with, her public image suffered. The final straw came when Dorothy was declared bankrupt. With no-one to turn to, and evicted from her home, she gave her last performance in 1990 and eventually accepted the charity of a fan in the small town Trebanog back in the South Wales Valleys, living in a house rent-free. It was here that Dorothy was to face her final battle, one that she could not win. In 1998, Dorothy died from cancer. 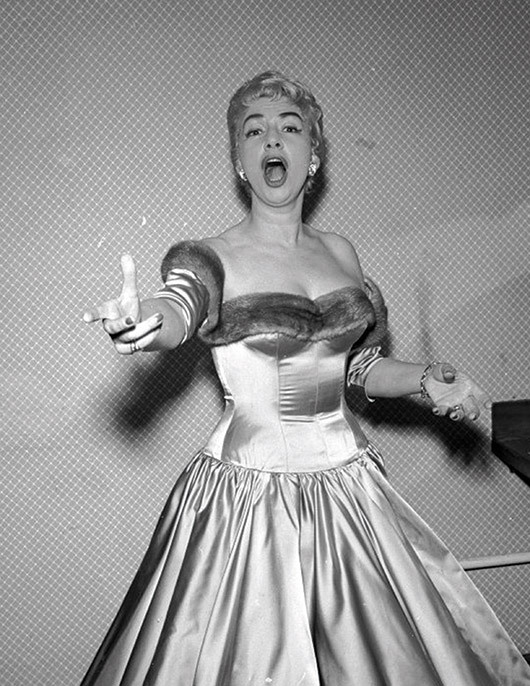 Dorothy Squires is a name worth remembering. A formidable woman, she should not be remembered for her 007 husband, or the controversy that surrounded her later years, but for her undeniable talent and the musical legacy that she has left behind. Dorothy did it her way. 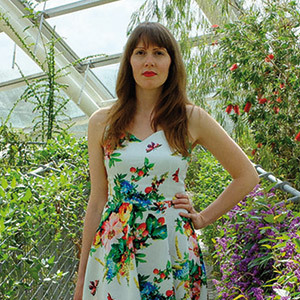 Sarah Winstanley is also known as Porcelina, a vintage lifestyle blogger living in the scenic South Wales Valleys. Her ideal date would be afternoon tea with Monsieur Poirot at the Burgh Island Hotel.